Miramar Beach, Panaji, Goa-403 001. 33 Kms. from Airport, 16 Kms. from Railway Station. 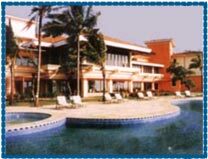 Hotel Goa Marriott Resort, Goa is situated on the Aguada bay and is located in the capital city of Goa "Panaji". 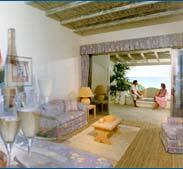 Goa Marriott Resort is built over spread over a vast area of landscaped garden. The resorts is designed on the basis of elegance and have been specifically designed with the architectural touch of Goa and Mediterranian touch. 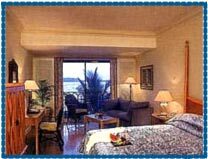 The bay view rooms that are offered by the hotel offers a stunning view of the bay and are the best bay view rooms available in Goa. 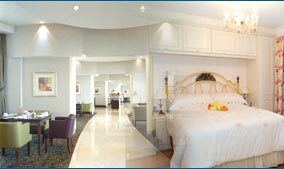 Goa Marriot Resort have been specificaly designed to serve to the needs of both leisure traveller and business traveller. 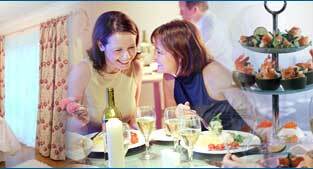 Individually Controlled Air-conditioning, Cable Television, Safe Deposit Boxes, Mini-Bar (chargeable), Data Port, Voice Mail Service, Air conditioning, Bottled water, Coffee maker/tea service, Crib, Electrical Adapters, Individual Climate Control, Iron and Ironing Board, Pillows: down/feather, Pull-out sofa Bed, Rollaway Bed, Safe, Washer/dryer. ESPN, Cable channel: HBO, Cable/satellite TV, Color TV, Mini-bar, Bathrobe, Bathtub with spray jets, Hair dryer, Separate tub and shower, Phone feature: speakerphone, Voice Mail, Two-line phone.